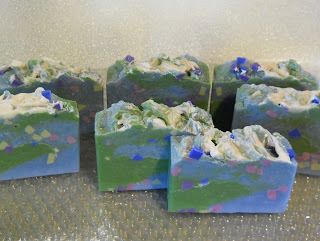 Week 10 of the Great Cakes Soap Works Challenge involves making a landscape soap. Thank you Amy for giving me credit for this idea I think! I hope I'm not too embarrassed to have been the one to suggest this exercise/challenge. I hope we are all still soap buddies after all this! KWIM. GreatCakesSoapWorks located HERE drop by and say a word! Thank you Amy for your faithful hardworking efforts on behalf of us, presenting this Challenge and keeping the herd of cats wrangled. You're the best! 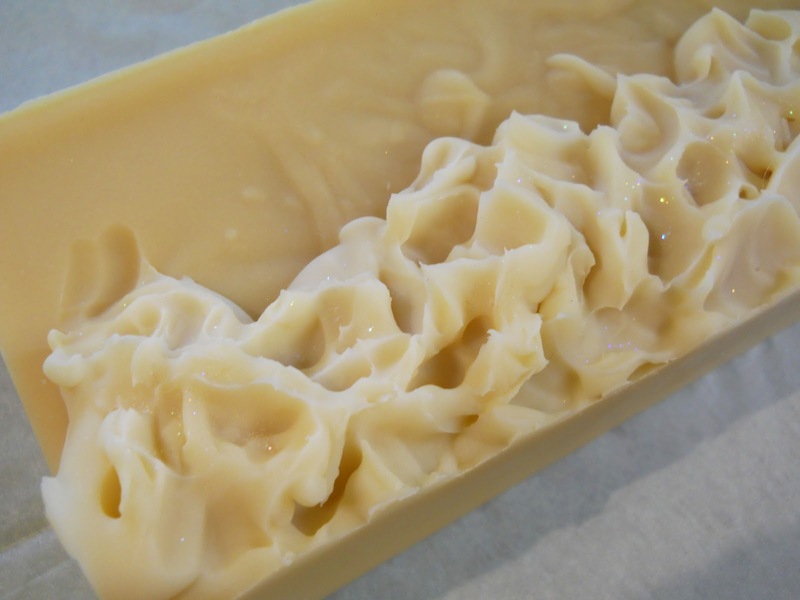 Having done a landscape soap in the past ah well I was not anxious to begin anew. The one I made previously was tough and as I was concentrating on the design process to such an extent, I forgot the Shea Butter! Well I kept one slice that sits in my studio window. Here is the photo. 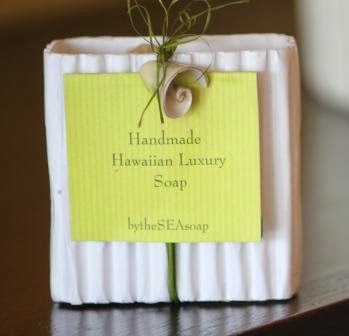 Do you know the feeling when you complete a batch of soap to find out you left out the Shea Butter? Yep I did. That poor soap was re-batched not once but twice! If you have a desire for a good summer read check out "Dear Theo" the story of Vincent Van Gough's life is so insightful, fulfilling and heart breaking all at once, the life of a true artist. Here is my tribute to another true artist, Claude Monet. Monet is my favorite French painter/gardening architect was Claude Monet who designed painted and lived in his Giverny gardens outside of Paris for more than 30 years. The last 30 years of his life he is said to have had a love affair with the Nypheas. Water Lilies. He produced over 250 painting of his lilies and pond and loved painting the sky's reflections as it fell upon the water, reflecting over and around his lilies. So this was my attempt to do a water/sea lily pond soap inspired by Claude Monet. 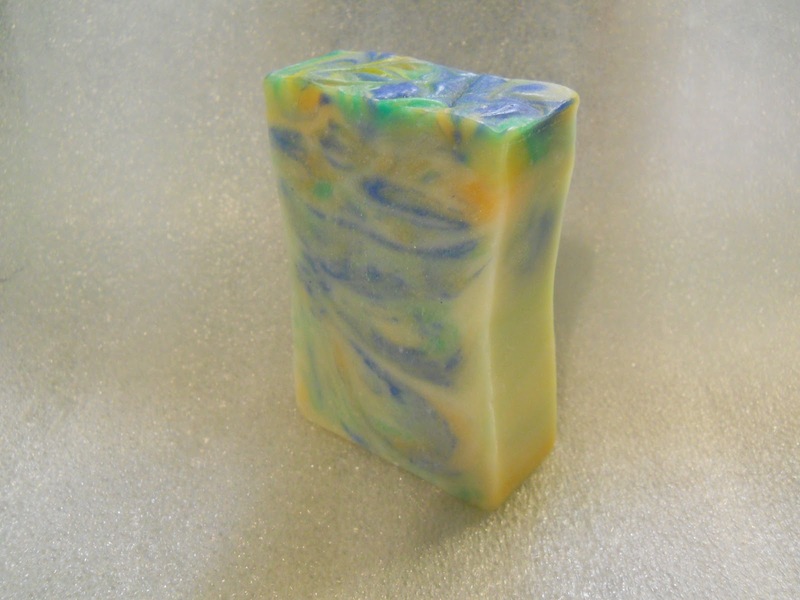 This soap was fragranced with a new to me fragrance of citrus and lilies that accelerated even though I took all precautions and colored and added fragrance with a wire whip! It's scent is of a lovely garden, not too sweet but with green accords in the wings. This soap smells wonderful! 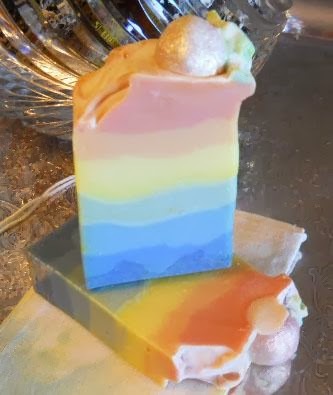 Yes I like this soap very much! It smells delightful, has my favorite colors, and a lovely fragrance. My tribute to Claude Monet's world famous Lilies, to the artist extraordinaire whose inspiration lives on in much of the art work done today from textiles to high art, to soap, paintings to color palettes used by retailers today! His genre is well named an Impressionistic Art Form as it still inspires over 100 years later! 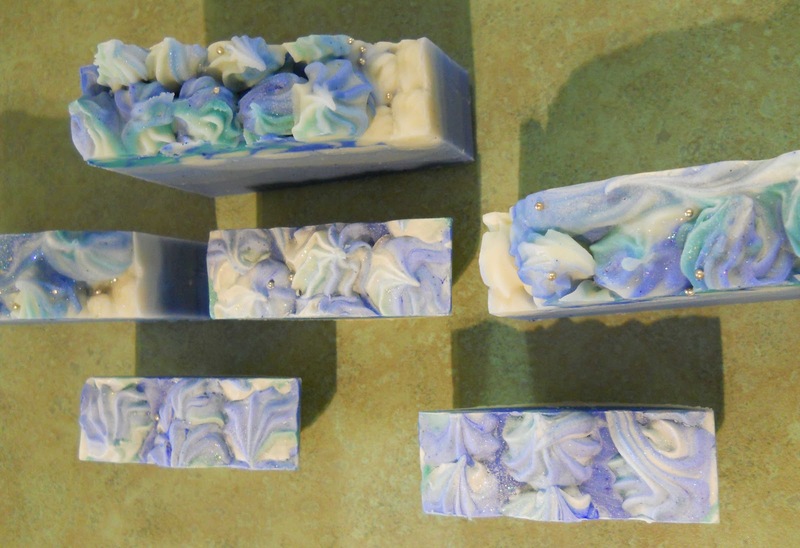 Here is a textured topped soap I made a few weeks ago. I didn't think I would have enough time to get another one out. But I did and the photos are below. This week has been a week of catching up after my soaping holiday. Emails, egads what did we do without email? I'm choking here in a good way! So please if I owe you a response I'm getting there I promise! I did work in a new to me peaked top soap, well fluffy anyway. 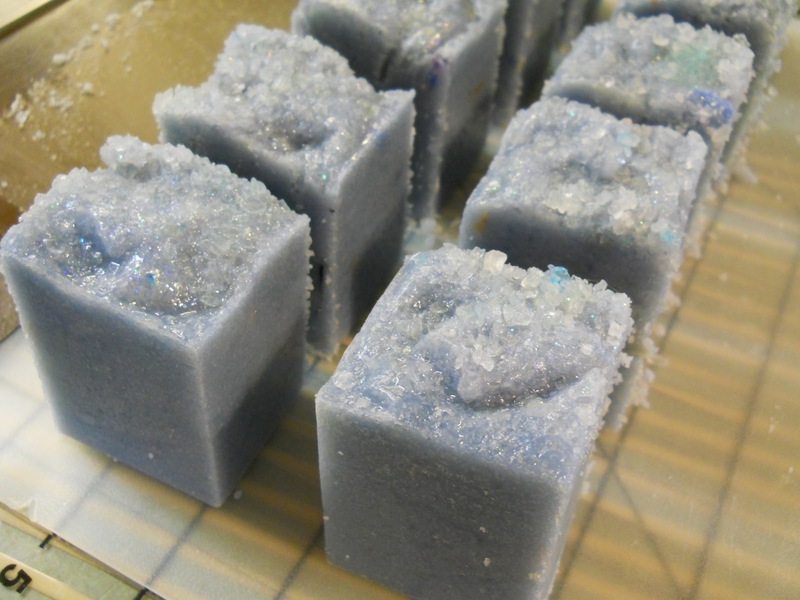 It's curing and already named, a beer soap called "Dragon's Brew"! A pale Cerveza Especial Modela was used for this soap. After testing a few beer soaps from the HSMG Conference 2012 in Portland, I wanted more! 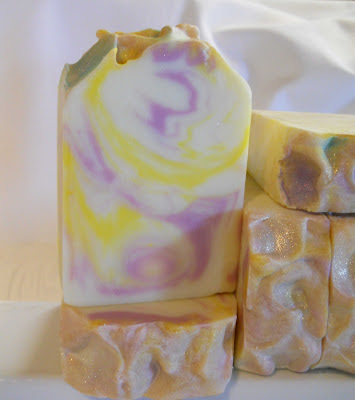 The texture is so interesting to me and the bubbles, like a cowboy who sleeps on silk sheets! I was surprised at the color. The white was to be beer foam, but the body isn't as dark I was thinking it would be! It should darken as I used a Dragon Blood fragrance, and time will tell! Surprise a beautiful soap waiting for me when l arrived home! A pretty soap sent by another soapmaker who is involved in the GreatCakesSoapWorksChallenge. 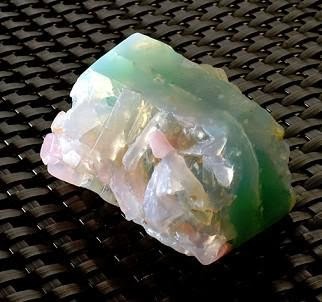 This beautiful soap from the ITP Challenge intrigued me for it's lovely soft colors and the choice of colors inparticular. I studied the colors as it was such a nice combination my swap buddy sent it to me! Many thanks go out to Santa Barbara Soap whose shop is located here!! I promise to use it after I'd admire it a little bit more! LOL The fragrance is lovely and I cut a tad off the bottom to use. A lovely soap thank you Tracy! Amy of Great Cakes Soap Works in an inspiration and again I thank you Amy for leading us along the soaping path! 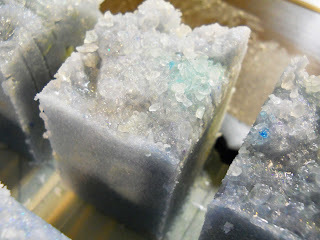 Her blog is here and you will find many pretty soaps of the other participants as well! It was so exciting to meet Eileen at the Portland HSMG Handcrafted Soap Makers Guild 2012 Conference this week. She is another participant in the GreatCakesSoapworks weekly Challenges! What a wonderful time meeting soapers from around the world and Eileen who hails from Canada our sister country and peaceful neighbor! As I was traveling this week, I did this salt bar last weekend so I could share it today! 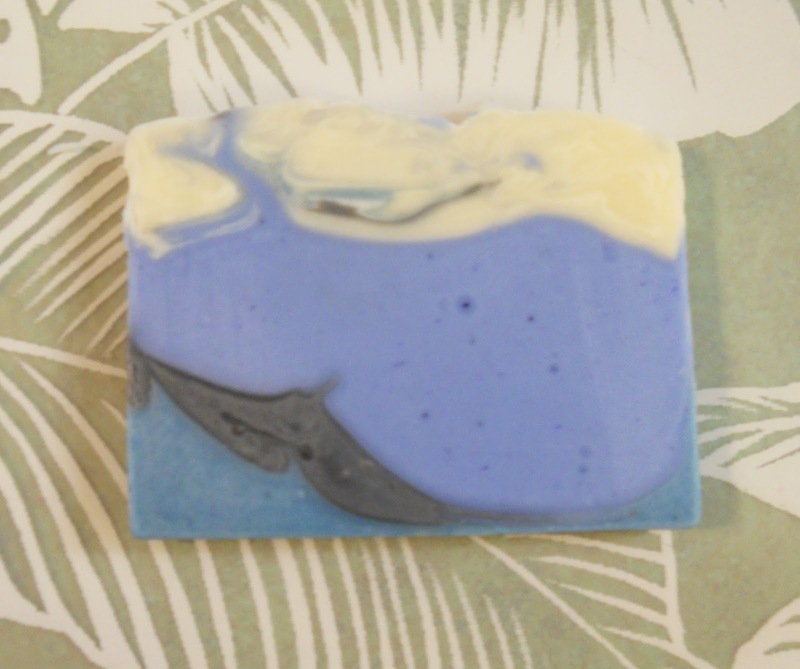 Think I should name this one the Blue Lagoon Sea Salt Bar? Or perhaps Situation Soap as it did get me into a situation! Once again many thanks go out to Amy Warden. She is a wonder in soap and in organizational skills! Amy has organized this International Soaping Challenge and currently there are 93 soaping artist participating in one part of this world or another. Wonderful artists and you can check them out at Amy's GreatCakesoap works blog and it can be found here! Here is the situation when it comes to Salt Bars, you must cut them soon after they are removed from the oven or well they turn into brick! So don't have previous plans that have slipped your mind. I'm cruising along in my soaping kitchen in the zone as they say and totally lost all track of time. Do you ever get into that creative zone so deep that you loose track of time? Yeah! A 6 PM engagement, not a problem. So I'm pulling this soap out of the oven at 5:50 PM and I'm due somewhere at 6! Holy rollerskating derby. What to do, what to do? I thought about insulating it in a bubble wrap lined cardboard box hoping it would keep warm enough to cut at 9:30 PM, panic, email a friend, she says ah freeze it for 20 minutes?, oh ah ok, and once again ~~THANK you Holly~~, a table fan! Why didn't I think of that! So I elevated the soap on top of my down draft fan for the oven on a pie cooling rack turned on the down draft, the overhead microwave fan and also a small table fan onto the sides of the mold. Forgot to take a photo in the panic. YES it worked and I was able to cut these babies in 30 minutes! Being afraid the center would ooze I cut the ends off and they looked pretty good so I split the log right down the middle and did cubes. These smell real good and I think they will clean up nicely. Rosemary mint lemon goodness! A touch of glitter on the top and there you have it. Do we need stock in the glitter company darling husband? So this is an 80% coconut oil soap with 90% sea salt in the recipe to make these spa quality salt bars and it should lather in salt water so I hear! A tip here do not use iodizes table salt! Interesting with these bars, the outside edges of the soap where the cooling happens first are so well defined and beautiful. The cut edges like in the middle are a little ragged. They should clean up when the cure is finished. They will be like tumbled rock smooth after the first use or two. Oh joy salt soaps, yeah! Name? The Rosemary Situation ? Sounds like a spy novel. 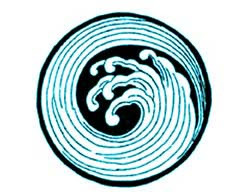 Sometime during this challenge workshop many of the soapers will be doing a swap of one of their creations! A bus-mans holiday in soaps and it will be exciting also! So I haven't contacted my swap person yet, when I return from the frozen north I will do that! 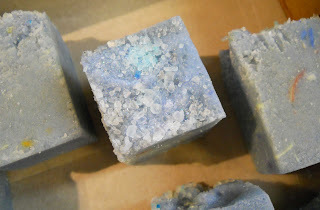 SantaBarbaraSoaps in Goleta perhaps I think they do beautiful salt bars if I have the correct shop! Oh here is a link to the recipe I used and I do like it. My adjustment to this recipe was to CPOP and cut right away! Drop in and check this out! Salt Soap ~~ Salt Soap Recipe here . Can't wait to get home and try these babies out. Week 7 The GreatCakesSoap Works Challenge. 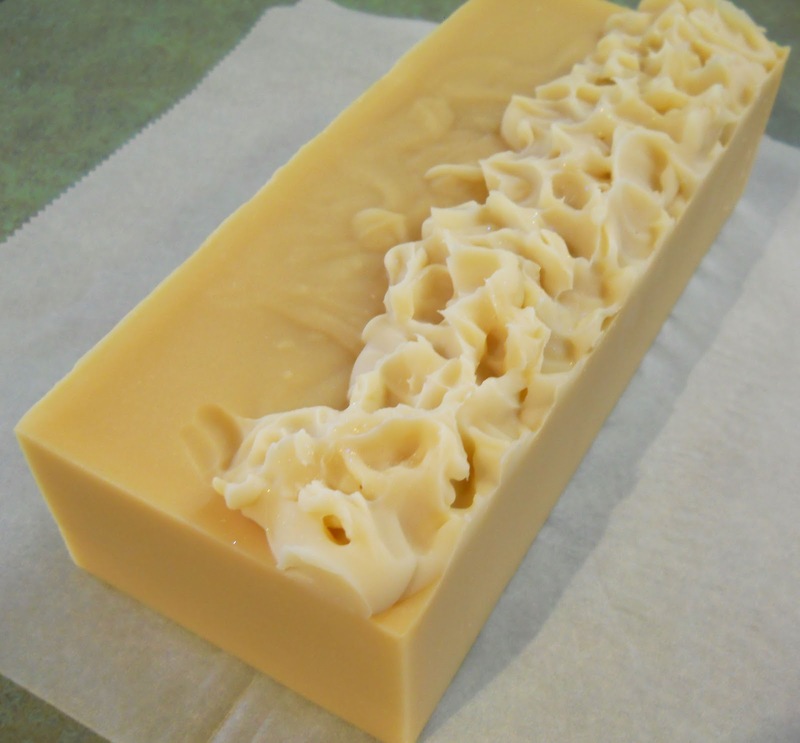 During week 3 of this great soaping challenge I created the soap I'm sharing today. I've posted pics of the tops for the piping exercises, but now I'll reveal the centers! This 7 challenge was to do gradient colored soaps. I happened upon this style while researching the piping skills in the 3RD weeks challenge. Here are gradient blues with greens and white in waves topped with pippedfroth and of course glitter! So I thought I'd bring this Week 3 baby back to the future. I call it Waves of Vetyver a soap for Week 7! Did I mention that I love BrambleBerries Vetyver fragrance oil? It is described here . It is not a single note like the essential oil of the same name, but rather has top notes of Lemon & Rosemary. The middle notes contain florals, Sandalwood and Patchouli and finally, the luscious blend finishes off with musk and vetyver. Hope to see you in a week or two! Gene and I will be headed off to Portland. As you get closer to these large bars you can see that my UMB didn't get mixed as well as it should. 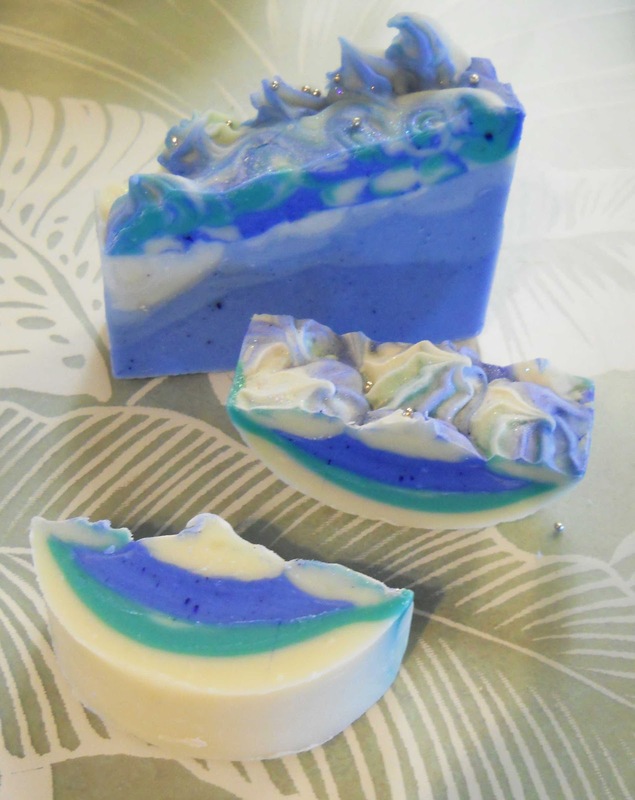 So we have kelp pieces in the wave soaps! That's it kelp or plankton for sure!